In celebration of Easter, we are introducing our Object of the Month for May a little early. Hopefully it will inspire anyone having a go at painting eggs over the Easter weekend! 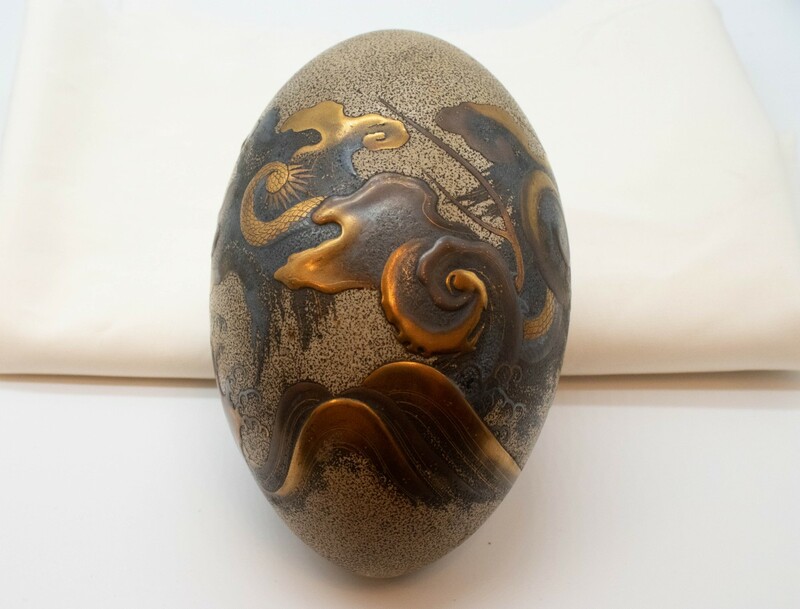 The object is a rare lacquer-decorated emu egg from 19th century Japan. Lacquered ostrich eggs were popular during the Meiji period in Japan (1868-1912), and were usually decorated with scenes of birds, landscapes, and flowers. 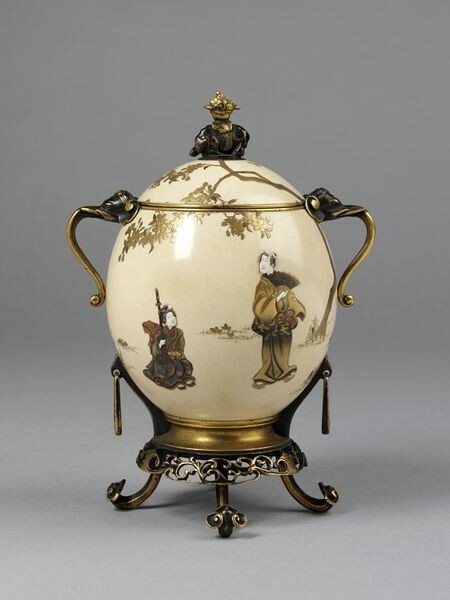 The following image is of a Japanese Meiji-period lacquered ostrich egg made into a cup by a French artist in 1872. It was purchased at the 1872 ‘Arts of the East and West Exhibition’ in London. The artist who painted the emu egg here at the Castle chose a dramatic design which goes with the natural grey pattern of the shell. A dragon appears to be emerging from the egg as if from mist, surrounded by clouds. 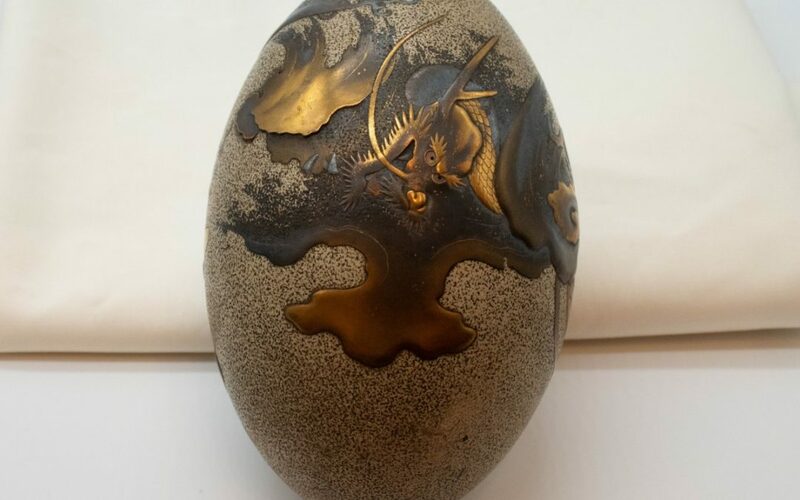 The gold and silver lacquer has been painted on in high and low relief, to give the impression that the dragon is inside the egg. Dragons with clouds were a common motif in Japanese art, particular during the Edo period from the 17th century onward. The famous woodblock print artist Katsushika Hokusai (1760 – 1849) painted a number of dragons emerging from clouds in monochrome ink. These paintings usually depict a mythical dragon who was said to be able to cause storms and bring rain. 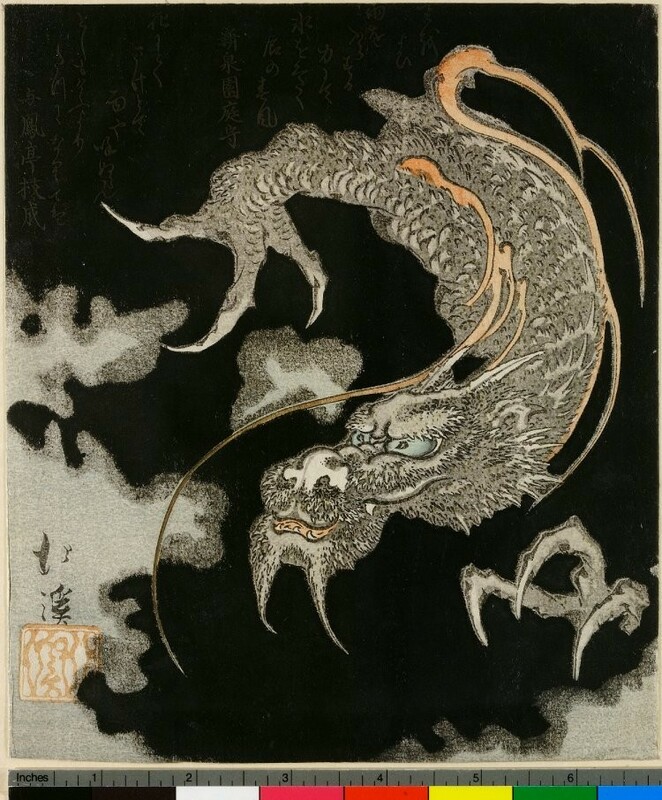 Japanese dragons are usually depicted with three claws, whereas in China they have four. A five-clawed dragon is a symbol of the Emperor in China, and is reserved for decorating Imperial objects and robes. 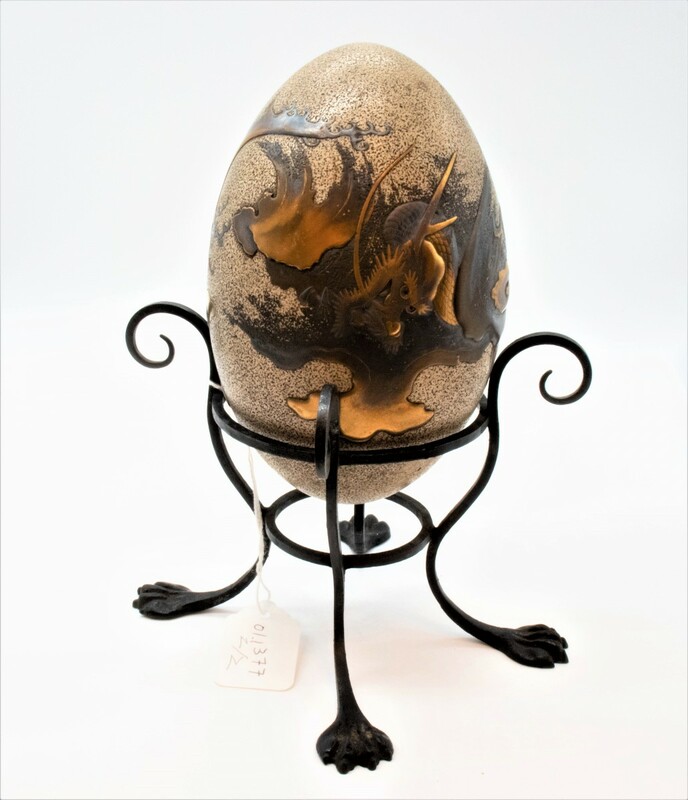 It is likely that this decorated egg was made to appeal to the Western market during the Meiji period. In 1868, Japan officially ‘opened’ its ports to trade with the West, and the Emperor Meiji was symbolically restored to power as the head of a new government. The warlord rulers who had held power in Japan for the last three hundred years were overthrown, partly because they had surrendered to the threat brought by the ‘black ships’ which had arrived in Japan from the US. During the Meiji period from 1868 – 1912, the new government aimed to follow Western examples in everything from politics and the economy to architecture, fashion, and culture. 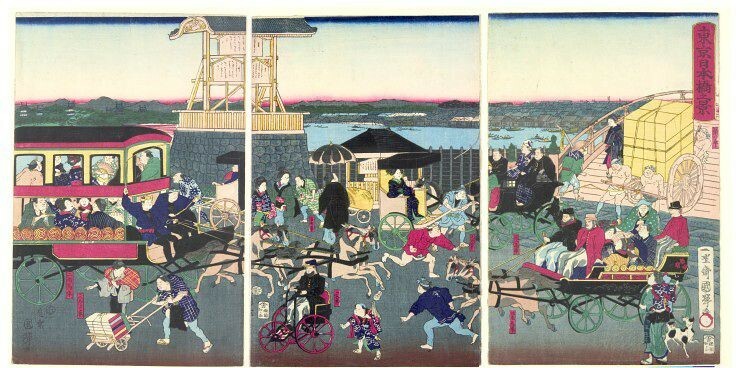 It became easier for Westerners to visit Japan and access Japanese art through exhibitions held in the UK. Artworks and decorative objects made to target Western tourists became popular. These objects showed off the technical skill and craftsmanship of Japanese artists, whilst aiming to express an idea of traditional Japanese art and design, in contrast to Western art. Western collectors in the 19th and early 20th century were interested in collecting ‘curiosities’ and unusual objects from other countries. This rare decorated egg would have definitely been popular for Western travellers. This object has been added to the Japanese Room at the Castle in time for Easter, come and see if you can find it!